Note that the flags that are on the second coat of arms are with crescent and star and only with crescent on the first one. 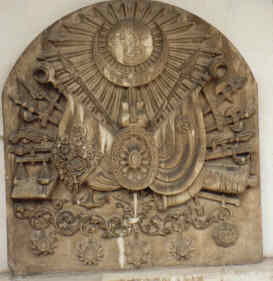 The red sandjak of the Ottoman sultan Selim I represents Zulfikar. This flag carried to Egypt by Selim I [1466-1520] can be seen in the Topkapi Museum. During the 16th and the 17th centuries the Zulfikar flags were widespread in Ottoman army and numerous red Zulfikar flags left in the battles in Europe are shown in museums and one can even see a red, triangular Zulfikar flag in the Doge Palace in Venice. Items seen in an exhibition of the masterpieces of the Topkapi Museum (Istanbul) held in the Palace of Versailles (France), Summer 1999. This is a small (ca. 15 x 5 x 2 cm) silver box which contained a Quran and was tied to the top of the Army banners, to put God's protection of them. This might be put in parallel with the famous oriflamme, which had the same kind of protective power for the ancient kings of France. Some of them are ornated with the three discs placed in triangle which appear also on the flag of the Rear Admiral of the Porte in the old Dutch flag-chart. The notice of the exhibition said this emblem represented the snow lion and was strictly reserved to the Sultan. So it might be either a coincidence or a misattribution in the old flag chart. A painting of the XVIIIth century made by a French envoye in Istanbul shows a French royal ship, with the Bourbon ensign in main mast and a plain red flag in jack position. In the Czech magazine Vexilologie [vex] #98 there were several articles dealing with the Turkish flags. Some of them are on display at Topkapi Museum and many information came from there as well. 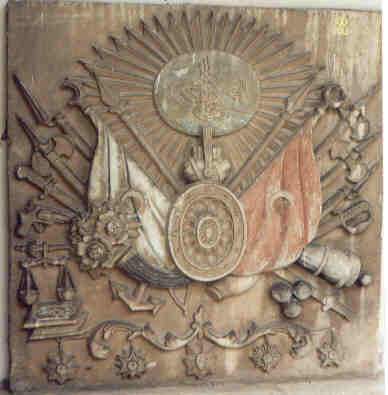 It seems that one of the oldest flags belonging to that museum was used by Osman himself. I don't think it would be possible to preserve the flag Osman used (13th century), it is probably an attribution.